Hack a Day is hosting a Sci-Fi contest on their new projects site. 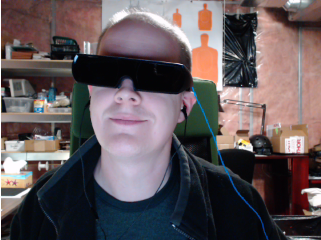 I decided to design and build Peril-Sensitive Sunglasses. Peril-Sensitive Sunglasses have lenses that turn completely opaque at the first hint of trouble, thus preventing the wearer from seeing anything that might alarm him or her. Douglas Adams' book The Hitchhiker's Guide to the Galaxy featured them. Click that link to follow the project's progress!